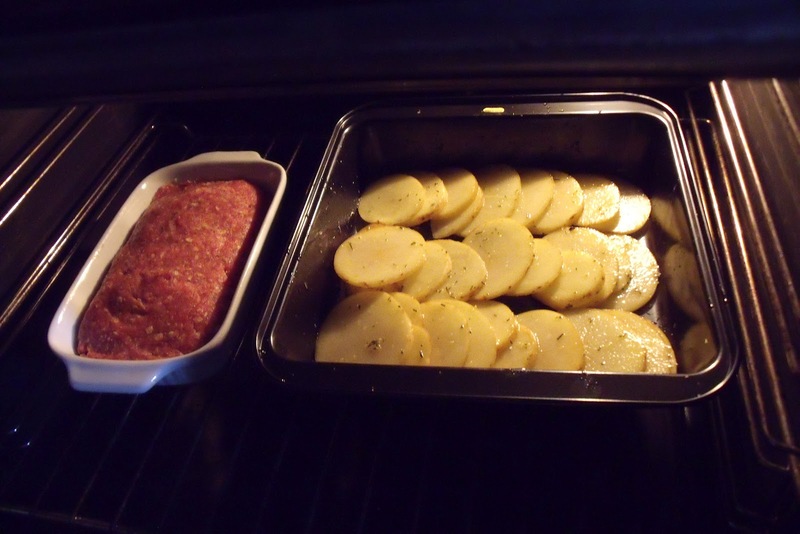 what's cooking in my tuscan kitchen: Meatloaf an American classic.... or Polpettone un classico tutto italiano??? 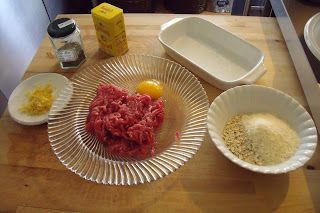 Meatloaf an American classic.... or Polpettone un classico tutto italiano??? Although I am sure I could eat pasta every day and never tire of it because of the wonderful variety of types of pasta and pasta recipes... we do NOT eat only and exclusively pasta at my house! Tonight's is a meat and potatoes meal! I usually don't blog meat recipes or casseroles because they are very "American" and my audience is prevalently American! But... tonight I am adding a mediterranean twist to an old American standby! 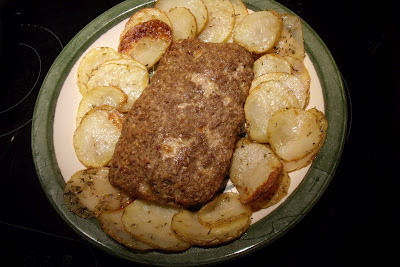 If you are American or have lived in the US for any period of time, you have eaten meatloaf! When you were a kid you either loved it or hated it.. and now that you are a mother, you probably fix it for your kids whether you belonged to the "loved its" or "hated it". Why? Simple, it's the base for an economical week-day meal! Well, guess what!? I think almost every country has its version of meatloaf! I have eaten it in Germany where it's called Falscher Hass. And, I have eaten it in Italy where it's called Polpettone. Some recipes really dress it up with hardboiled eggs, cheese, vegetables, ham and who knows what else hidden inside, so when you slice it you see the surprise filling. I personally prefer a more simple approach, using spices and other ingredients to change the taste of my meatloaf based on my culinary mood! When I am in a real American mood I add some ketchup and chopped onions to the mix, maybe even a tablespoon of prepared mustard. But... when I am in an Italian mood, I go for a mediterranean taste! 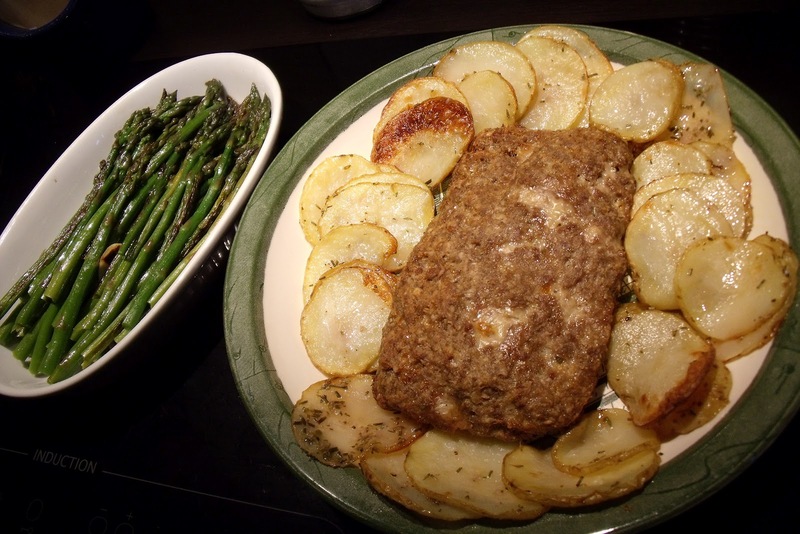 Tonight's meatloaf definitely has a mediterranean twist! I got a jar of mixed mediterranean spices as a gift from Anna, a lovely lady I met in Sardinia. Basically its a mix of dried oregano, rosemary, marjoram, rosemary, thyme, myrtle and savory. Mix all of the ingredients - go ahead and use your hands! Tonight with my polpettone I am also serving oven fried mediterranean potatoes and wild asparagus. 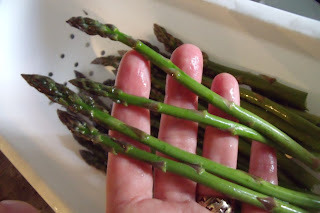 The asparagus is easy. 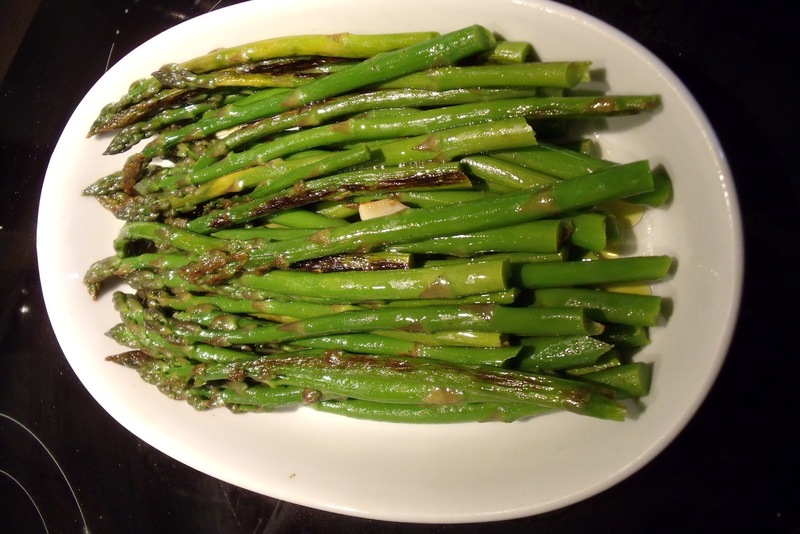 Wild asparagus is much thinner than the cultivated type and as a more nutty flavour. We prefer it to the cultivated variety. 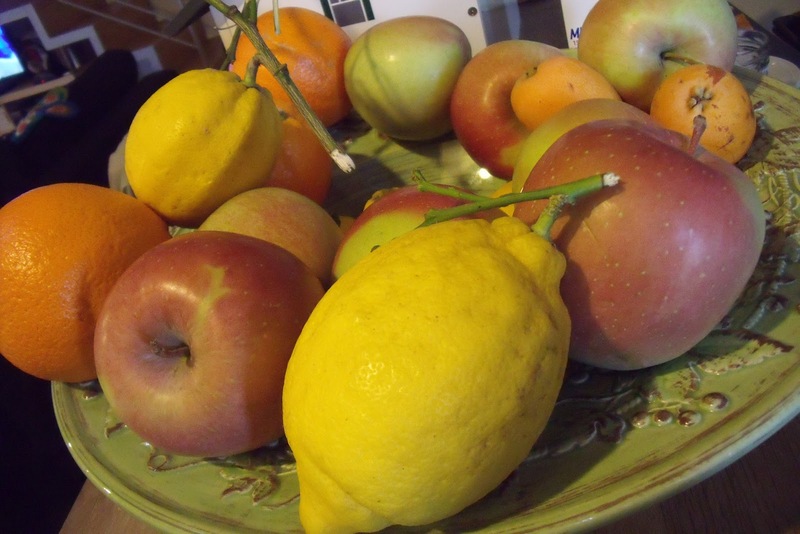 Snap off the tough ends of the stems, wash well in cold water. Sauté with garlic, extra virgin olive oil, about a 1/4 cup of water - over high heat for about 10 min. Keep warm. 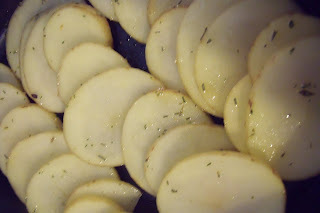 Slice the potato into 1/8" slices, toss with the other ingredents. Arrange in a non stick baking dish. 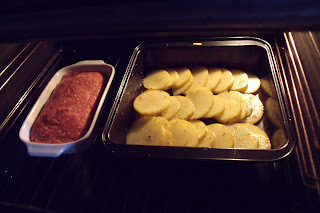 When the potatoes and meatloaf are done, remove from the oven and arrange on a serving dish. 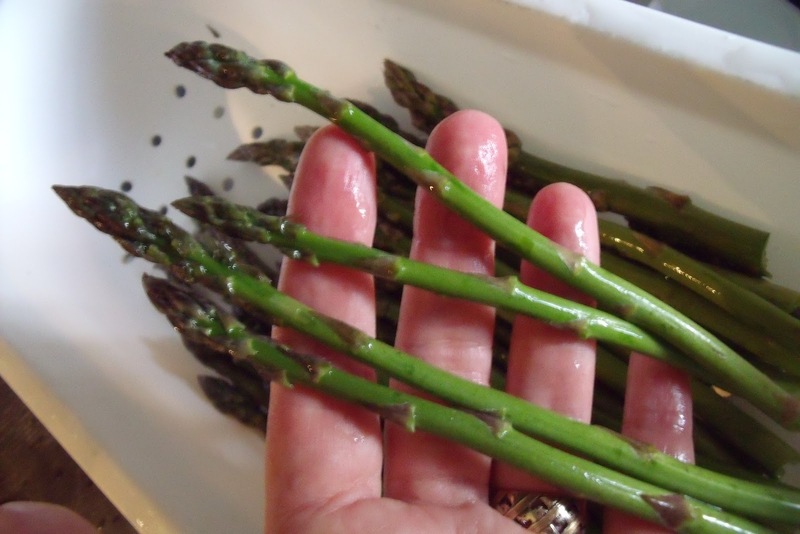 Pop your asparagus - covered with foil - into the hot oven for a few minutes to heat while you are fixing the serving plate. And as Julia Child would have said had she spoken Italian....BUON APPETITO!! kick. I little ! of both "is a good thing"
Should the truth be told.... the thought of frying burgers tonight was not at all inviting!! ;) better to pop it all in the oven! Should have put the asparagus in too! I could have put it in the casserole raw with garlic, oil, salt and pepper, covered with foil and in the oven with the rest! Next time! My mouth is watering....I love meatloaf and this one looks amazing. The asparagras and potatoes are perfect . This could end up being a super favorite. Thanks donna. Sounds tasty. Your family is lucky to have you, but you know that. the question is.. do they know it?? ?